Fig. 1 - ca. 1380, Koolskamp. Fig. 2 - ca. 1360-1400, Gent. In the Southern Low Countries (the current region of Flanders) it appears that frilled veils were often worn together with a circlet during the late 14th century. 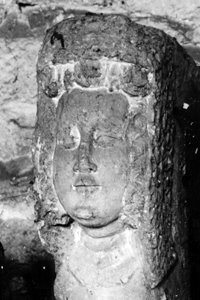 This style appears namely on stone sculptures such as funerary monuments and decorative achitectural elements. Presumably this style was worn mainly by the noble elites and possibly also the urban upper echelons, as the coronets were made of (precious) metal and thus would have been quite costly. The circlet was worn underneath the veil, so that is was visible only accross the forehead. The circlets were decorated with ornate floral elements in varying sizes.You can find some more examples here. Fig. 3 - Male head, ca. 1300 (? ), Gent. I've been wanting to have exactly such a circlet for quite some time now, to wear with my own frilled veil. Because the circlets in the images with frilled veils are largely obscured, I collected some photos where they are more clearly visible. Fig. 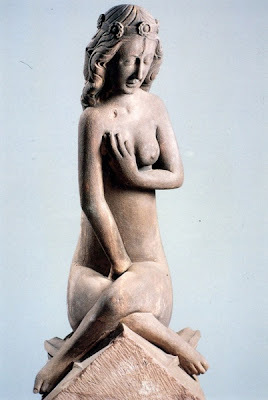 4 - Naked woman, 1301-1315, Freiburg im Breisgau. Fig. 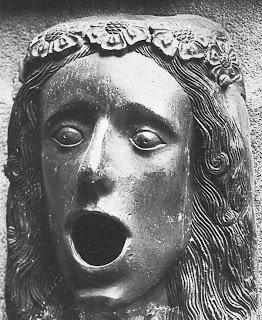 5 - Console, female head, 1401-1500, Schweinfurt. Fig. 6 - Fountain mask in bronze, ca. 1400, Nuerenberg. The next step will be to find extant examples of similar flower shaped rozettes or completely preserved circlets to base a replica on. And save mony to pay for it, not quite unimportant! Many thanks goes to Ewa for sending me Fig. 4-6. What a nice project ! Hi there - love the blog. Was visiting some 15C/16C wall-paintings in south Wales and saw, in a scene of St George and the Dragon, that Princess Sabra was wearing a circlet! I don't have a great picture of her (she is quite high up on the wall) - but I'll search through what I've got, if it might be useful for you. In the meantime, I don't know if you've seen this one? From a misericord dated to c. 1500, in St Mary's Church, Beaumaris, Anglesey. oh that's a nice one! thanks! that could be a fun project to make! 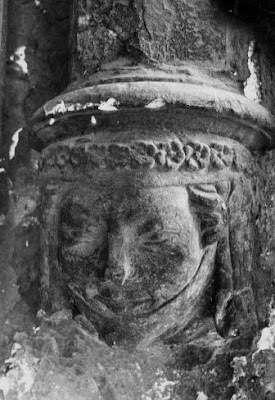 It's from Llancarfan Church in the Vale of Glamorgan. 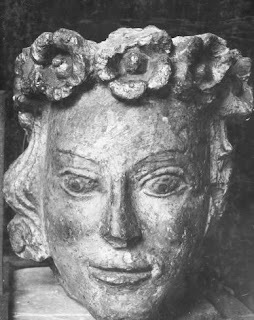 For my current project, I'm looking for examples of 'turban-like' headdresses in sources pre-1300. Do you know of any?